We’re big believers that some of the biggest lessons you’ll ever learn in life, are those learnt in unlikely places. The human mind is programmed to enjoy fun and if you’ve ever studied the science and psychology of memory, you’ll know that the more fun your brain has, the more likely something is to stick. Personally, one of the things that excites me is making connections between design and user experience in places that are…well, a little unusual. After being tattooed recently, I had the privilege of a conversation which helped change (and reinforce) my personal perspective as a designer. So in advance, I’d like to thank Dale Sarok, for being the genius that he is. As designers, we’re already aware that being humble is rule number one. You’ll notice that some of most successful designers, are the ones that are kind, considerate and offer actionable feedback to those around them. What hit home here, is that it’s not only the design industry that works like that — it’s the tattoo industry too. In fact, there’s probably a solid argument that being humble is your ticket to being awesome in any (and all) creative industries. After all, being humble keeps you open minded, ready to learn and open to helping others (and being helped in return). You can still be humble and be proud of your work, after all, it’s your work that’s built (or will build) your career and kingdom. 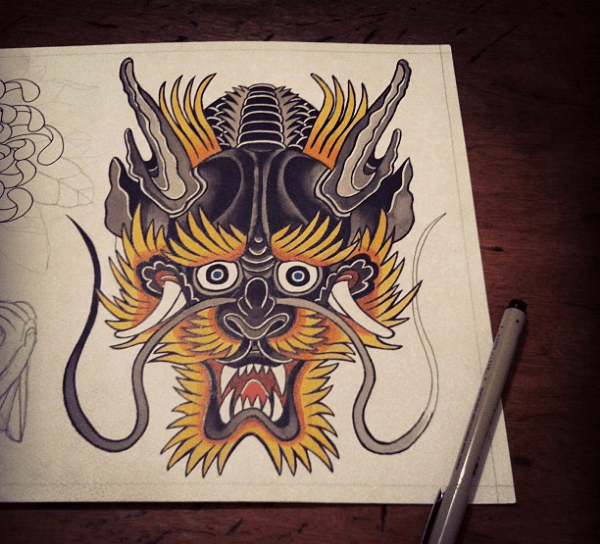 Most tattooists aren’t masters of marketing, social media or growth — so why are they always doing so well on Instagram? Well, if you’re following tattooists on Instagram, it’s because you love what they do, their style and the way their art speaks to you. Art is subjective, but it’s subjective in the sense that there’s a difference in taste rather than talent. In the same way a talented designer on Dribbble has a cult following, a talented tattooist will follow suit on similar platforms (like Instagram). There are ways to inflate these figures, through giveaways and small marketing initiatives, but ultimately if the work isn’t good, the inflation is only temporary (and it means nothing). Will inflating these figures affect your bottom line? You could have 50k followers and no work — why? Because people don’t want what you’re selling, and what you’re selling is your talent and your time. Work hard, keep learning and your work will start to move mountains. For tattooists, it’s pretty important that they learn to hold a conversation. When you’ve got someone in a chair for two to eight hours (that’s being stabbed with a needle) the last thing you want is for them to feel uncomfortable, worry or get restless. It’s why they hone their ability to speak, the ability to create conversations which (although seemingly unimportant) change the way clients feel about being tattooed. Learning to hold a conversation and to speak to others is invaluable for any designer — why? Because like tattooists, the people you’re working with feel pain that you need to solve every day. CEO’s, marketers, user experience designers, clients they all feel pain that only a designer can solve. Learning to speak to these people (and hold a conversation about what matters) will make your job easier. It’ll help you articulate complex solutions or design-based decisions that, they might not completely understand and it’ll make them feel more at ease with you and what you’re doing. Most importantly, it’ll keep them coming back to you, what you do and what you know. One of the biggest no-no’s for a tattooist is to work on or with television. It’s an unwritten rule that alienates you as a tattooist from others in the industry — it’s selling out. In the eyes of tattooists, it devalues what they do and adds drama to an industry which is otherwise very much at peace with itself. Selling out is different in each and every industry, it takes time, patience and due diligence to understand what it is you can and can’t do. Ultimately, being respected by the industry you’re working in will earn you more money (and friends) in the long run than selling yourself short for a lump-sum of cash. Selling Dribbble invites is a great example of how you can sell out in the design industry (in a really bad way). There’s also a very grey area when it comes to selling designs on places like 99designs, so tread with caution. It devalues the platform, upsets other designers and is just plain wrong. Keep your eyes open and your ears to the ground, it’ll help you get a feel for what are some do’s and don’ts are in your industry. For tattooists this is business 101. They have to live with your work forever, it’s etched on to their skin and they’ll never be able to change it (not easily anyway). The same principle applies with design. Clients and companies hire you to help shape their vision using your experience. Of course, they trust in you and value your insight, they wouldn’t be working with you otherwise. It’s important, to understand that as much as you’re helping shape their vision — it’s precious to them. Clients or employers will need to live with your work (and the vision you help create) for a while to come, and depending on what it is you’re doing… maybe indefinitely. They can’t make the changes themselves, they can’t edit your files or the designs in the same way you can. You may only have to live with what you create for a few weeks, but they’ll have to live with it for so much longer. Keeping clients happy and giving them the best direction you can, is all you can do… and that’s enough to make you a winner. Every tattooist can tell you about the ‘worst’ tattoo they’ve ever done. It’s a vivid memory for them and they’ll be able to tell you why they don’t like it and what exactly what they’d change. Chances are, they’ve probably even asked the client if they can touch it up (because it bothers them that much). Being able to look back at your mistakes and what you’d change or improve is an admirable characteristic, it shows how much progress you’ve made. It’s easy to admire the good and fondly look back (and enjoy) the things you’ve done well. It shows you’re growing and you should be proud of that. Sure, they’ve got similar interests, but more often that not, its because they love the work they produce. Making friends in any industry helps you learn more, keep up to date with trends and it helps you get your name out there too. Different people think in different ways, and everyone’s got a few tricks up their sleeves that they’re more than happy to share. Don’t look at making friends as ‘networking’. …and it’s relevant to your interests in a good way. You’ll learn more, be introduced to new opportunities and get actionable feedback — the list really does go on. Plus it’s true what they say, you can never have enough friends. Look for things in unexpected places, you’ll be surprised what you learn.